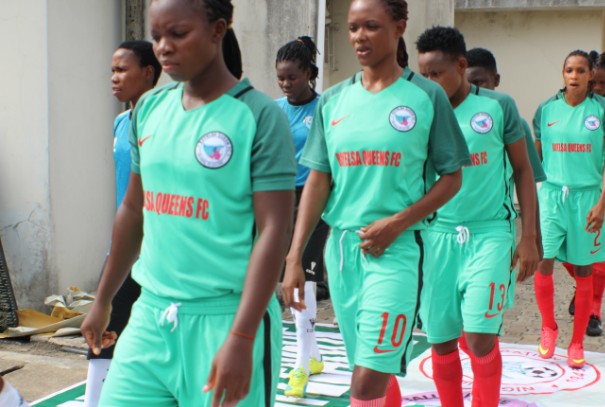 Bayelsa Queens’ captain, Joy Jerry, thinks the club should start setting higher targets for themselves as they prepare to take on three other solid teams in this year’s Nigeria Women Premier League (NWPL) Super 4. The young attacking midfielder feels it is the right time for the ‘Restoration Girls’ to lift the coveted NWPL trophy knowing fully well that the club last won it twelve years ago. “We all know what is at stake and we want to make sure we work harder to achieve this difficult task. “The fans are really pushing us to come back home with the cup. We also want to win it as much as the fans do,” she told NWFL Media. “It’s been twelve years we won the league and we need it so badly now. We are more hungrier for success than ever before. “Playing against teams like Nasarawa Amazons, Sunshine Queens and Rivers Angels means that we have to be better than ever before on the pitch and we are good to go. Bayelsa Queens have only won the NWPL title thrice. They were Champions in 2004, 2006 and 2007 and will play their first game against familiar foes, Sunshine Queens, a game Jerry feels they need to win outrightly to avoid penalties if their dream of playing in the final is to come past. “Like I said earlier, the Super 4 is played by champions. Sunshine Queens is a very difficult side, but we are more focused on getting to the final if we ever have a chance of lifting the prestigious title. We want to win outrightly and prepare early enough for the finals on Sunday,” Jerry concluded.